The Daily Kirby: 39 YEARS AGO TODAY along with the 15 new Kirby covers that had been already released in 1977 there was also two reprinted covers. 39 YEARS AGO TODAY along with the 15 new Kirby covers that had been already released in 1977 there was also two reprinted covers. 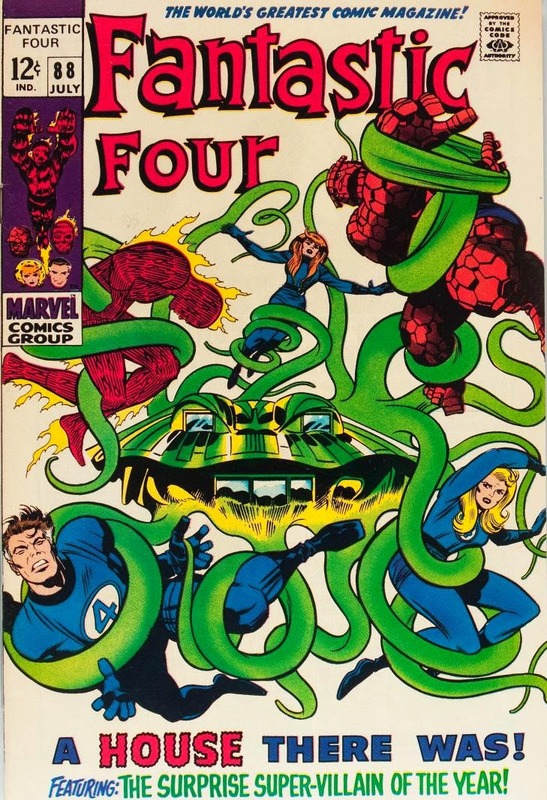 This one was slightly altered which was apt because it only reprinted 18 of 20 pages of FANTASTIC FOUR #88. Hiente in the Marvel U! LOL! That's more than slightly altered. It's completely redrawn. Buckler's pencils, I'm guessing. Sinnott's inks point to this, since the way he inked the Thing changed substantially after Kirby left. Little details like the flames coming off Johnny and the placements of shadows have changed also. But the general layout is so close to the original that I think it must have been used, either in projection or graphite transference.